Aaahh, the lake. Who wouldn't love a day at the lake? We arrived at Uncle Bob's cabin at about 11, met his friends Tess, Randy, and Clarence, and got suited up. We ran into the lake. Mini-me started to shriek and ran out. Turns out she did not find minnows nibbling her feet to be cute or funny. Flower loved the minnows and spent a good 30 minutes minnow hunting. After lunch, Flower, Mini-me, and Curly got in the boat with Uncle Bob and Auntie Ree while Patch and I took a nap at the cabin. They came back with such fun stories of tubing that we had to check it out, too. Curly held Patch in his lap on one side of the giant tube while Flower and cousin Sara were on the other side. Even though Uncle Bob drove the boat very slowly, Patch did not like tubing at all. I then got a chance to try with Mini-me on my lap. We had a bumpy ride, and it was so much fun. Lake Miltona is a beautiful lake about 2 hours north of the twin cities. Curly's family has been going there for years. When you go to Lake Miltona, it is a sin to leave before sunset. They think the Lake Miltona sunsets are the most beautiful sunsets in the world. While I agree that the sunsets are spectacular, I disagree that they are the best in the world. I think you can see a beautiful sunset wherever you are; we just don't take the time to look at one very often. Being in a place like Miltona where cell phone coverage is spotty and rare, where the tv is only turned on because the weather is making it dangerous to be on a boat, makes it a place where you slow down enough to appreciate a stunning end to the day. Day 4 will be spent in the car. Again. I think Day 3 has been the kids favorite. Flower called the lake "Solla Sollew," which is a song from Seussical about the most beautiful place you can go in your mind. I don't think tomorrow will quite compare to today. We won't even try. I think it might get a little redundant to talk about how we were in the car again today. So I won't. This morning, we awoke to the dulcet tones of Patch crying in the crib. The hotel clock said 7:30. We got up, got ready, and got down to the car by what we thought was 10. It was actually 9. Ooops. Lucky for us, Grandma and Grandpa are early risers. By the time we got there, Grandpa had already been to the store for chocolate milk. We had brunch with Aunt Lisa and Courtney. Courtney is very tall. Taller than Curly. Flower couldn't get enough of her. Grandma outdid herself again. I think I know why I love to cook. We drove and drove and drove some more. By hour 4, Flower had smacked Patch and shoved Mini-me's feet. We had to draw boundaries. Mini-me lost gum privileges yet again. An hour away from our destination, I decided to show the kids how to make trucks honk. We pumped our arms up and down and only got one honk. Patch thought he was responsible and shrieked and clapped. We let him live in his delusion; he won't remember it tomorrow. Tonight we are sleeping in St. Cloud, Minnesota with Auntie Ree and Sara. Tomorrow we go to one of the 10,000 lakes. Does it get any better? We made great time today and arrived in the Land of Lincoln at about 5:30. Grandma made lovely party sandwiches, which we devoured. So much tastier than a Big Mac. The girls discovered the toy closet and Patch discovered the rip-apart referee. As we left, Mini-me sighed and said "Your Grandma has the most beautiful house." It's too true. We are staying at the Double Tree down the street from my grandparents. The kids are exhausted, yet wired. They have been scrubbed, tubbed, and adequately fed, but still refuse to be taken into the arms of Orpheus. (Or is it Morpheus???) At any rate, they refuse. The drive was not too terrible. We had to remind Flower that she was not, nor never would be, the parent of Mini-me and Patch, and that she needs to mind her own business. Mini-me lost her gum-chewing privileges an hour into the drive, and Patch decided to exhibit his song-stylings as we drove along the Chicago suburbs. We only used the DVD player twice, as the girls were enthralled with their Toobs. We even rigged up some head phones (or "ear pods," as Mini-me called them), so we could listen to our music instead of Pooh's Heffalump Movie. I would say that a good time was had by all today. So far we still like each other. We'll see if I say the same tomorrow. I have not posted in a couple of days because I have been busy getting ready to go on vacation. While I enjoy being on vacation, I don't enjoy going on vacation. This time, we are driving to Idaho. That's a long trip. We have planned fun stops along the way, so hopefully our kids will enjoy the journey as much as the destination. I do have my doubts, as Mini-me and Patch can't stand being in the car for more than an hour or so, but I am hopeful it will turn out better than I hope. I will try to blog from the road, so keep checking back! I love to read. When I was a kid, I preferred reading to friends. My brother would tell you that it wasn't so much a choice as a byproduct of being a dork, but whatever. I read a lot for pleasure, even during the school year. I have to admit, even my love of reading couldn't help me pass a Mr. Rouse pop quiz on A Tale of Two Cities. But I digress, and get ahead of myself. Just a bit. One of the reasons I love Harry Potter so much is that it's something we all read together. I can count on one hand the number of friends I have who are not reading it. What I enjoy most is being able to have a discussion on the book, beyond just "Oh my gosh! Snape is Hermione's real dad!" I like discussing themes and application. That's why I love my book group. We move beyond the storyline into application. For those who don't want to hear the words "Harry Potter" before they've finished the book for fear they will hear something that will ruin the ending, stop reading now. Now that I have you alone, I thought I would share this juicy bit I just heard from a Harry Potter gossip site. JK will reveal on her Dateline interview (this Sunday, bits and pieces on the Today show Thursday and Friday) that she is not quite done with Harry's world. She plan on writing a sort of "Hogwarts: A History." I am so glad she's not done. I still have some questions. My guess is the book will come out some time with the last movie. Even I have limits, folks. 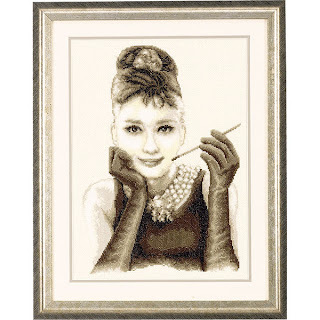 Do you really need to cross stitch a picture of Audrey Hepburn? I guess if you're a fan, you do. 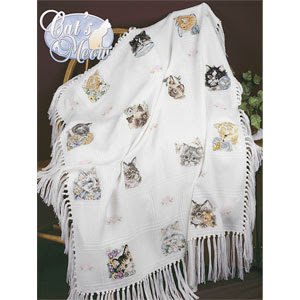 I also would never stitch an afghan of kitties. 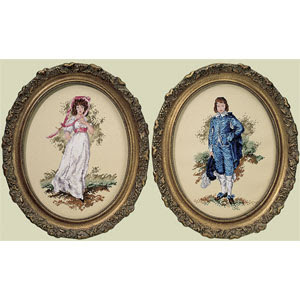 This one belongs in Umbridge's office. 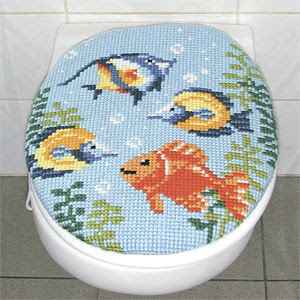 Would you feel comfortable using this toilet? Not so much. And this design reminds me too much of this guy. I finished the book last night at about 1 am. I admit, there were parts where I cried. I thought it was wonderful. I would love to discuss it, but I won't put anything here, because ruining the book is just what Voldemort would want. Feel free to email me and we can chat about it! I wish I could say that my experience in getting Book 7 was as awesome as my cousin's, but alas, it was not. It wasn't even close to awesome; it was tedious and long and exhuasting. My friend Rebeccah picked me up at 10:30. We had planned on eating first and then heading over to Borders to pick up our pre-ordered copies. It seemed like a good idea at the time, since when the last book came out, pre-orders got their books ahead of those who just showed up to pick up a copy. We pulled into the parking lot shared by Borders and Home Depot and had to park next to Home Depot - that's how many cars were there. We walked into the store to see wall-to-wall people. Our Borders is not big, but it was packed. We quickly found out that it didn't matter if you pre-ordered or not, the only way to get the book from that store that night was to pre-order. So all those people, packed like sardines, had signed up for the book months ago. We joined the line to get a colored wrist bands. When you got the book was determined by what color you had; orange, green, silver, blue, pink, and purple. We waited in a line that snaked around the books on tape and bargain books for 45 minutes. Finally, we got our purple band. Then we waited another 45 minutes or so until we could line up. There was no one telling us where to go. Every once in a while, a woman would get on a mic and say "Pinks, line up now." When it was purples turn, we found that there were 3 different lines. In order to prevent a riot, we allowed merging. After waiting in a line to be told when to wait in another line, I had the book in hand and was waiting in a third line to pay. While in the lines, I heard several conversations I am trying to forget. I hope it was just mere speculation and not spoiling the book. I did manage to see the last chapter title (because the little girl in front of me said "Look!" and showed me), so I know the world does not end. I got home at around 2:30 and managed to read about 2 chapters before I finally collapsed. I am hoping for good naps today so I can read a few more. Curly got on the phone with tech support last night and fixed our internet. Hurray! I can now download with the best of them. Thanks Curly! You're great! The day is finally here. I was watching the Today Show, and a guy on it (interviewed by the incomparable Tiki Barber) said this was the fable of our generation. When has anything like this ever happened before? I hope it happens again. I love being swept up in the hype. My computer has been slow. You would think we had dial up. I haven't been able to read my favorite blogs because I give up in frustration waiting for sites to load. I haven't blogged because of the same reason. That, and I've been reading Harry Potter. I am on book 5. For this book, I am reading the British version that my parents brought me from Scotland. As I read, I wonder what made them change some of the words. For example, would we really not understand that a "dustbin" is a "trashcan"? Or that a "hosepipe" is a "hose"? Who decided to change it? Who gets to read the book and make the changes? What is the job title? Are they hiring? Last night I had play selection committee. I am still pushing for Annie, but it looks like I'm the only one. Oh well. While I was gone, Curly showed Mini-me some of the Harry Potter movie. She loved it. She thinks Harry is so cute. She does not like Snape. She said he was "so scary to me." I think she agrees that Snape is a double agent for the Dark Lord. I can't wait to find out! It was bound to happen sooner or later. Our dog is part beagle, which means it has the wandering gene. This morning, she took advantage of an unlatched gate and a Harry Potter fanatic and got out. A neighbor across the street found her, went to the house 2 doors down from us and asked the girl, who happens to be our teenage babysitter, if anyone on the block had a cute puppy. She said no, and with that, Gracie took a trip to the pound. Oh the shame. $34 later, we have our puppy (who apparently is not cute) and a new tag for her. If the find her again, they increase the fine to $50. If it happens a third time, I am going to say "Gracie who?" I am a Harry Potter fan. For me, it doesn't get any better than that good lookin' wizard flying around on his broomstick. I caught Potter-mania when I came home from my mission and read the first 3 books in about a week. I did not preorder the 4th book, and I regretted it. I was living in Utah at the time and anything trendy sells out in about an hour there. I had to wait for amazon.com to get back in stock. When the first movie came out, I was working on Capitol Hill and decided to take a personal day, citing some vague "appointment," and saw the movie at about 10 am with my parents. Loved it. (I was also found out by my boss. Oops.) I did not preorder book 5, but there were plenty of copies to go around. The movies for books 2-4 were all seen by the second night. For book 6, we were vacationing on The Cape with Curly's family. We left our kids in the hotel room with his sister at about 11:00 and got in the car, driving until we spotted a Border's or Barnes and Noble. We found one and by 1 am had a book in hand. Oh the lengths I will go to be a part of the Potter world. I have yet to dress up as one of the character at any of these book or movie events, but there is still one book left and several movies, so I wouldn't rule anything out. Knowing my love of Harry (I even suggested we name Patch Harry...), you won't be surprised to know that Curly and I got a babysitter last night and caught the 9:40 showing of the movie that came out Wednesday. I know some people thought it was "just okay," but I thought it was fabulous. For one thing, it was about an hour shorter than the previous 2 movies. In the book, Harry finds himself shouting a lot, and also isolating himself from his friends because he feels they don't understand him. I felt the movie toned that down a bit, but it still played to his teen angst. As always, my favorite was Ron Weasley. That kid has perfected the grimace. He also has the funniest lines. The next book comes out a week from today. This time, I have preordered. I don't yet have a sitter, but I'm not too worried. Maybe we'll go see the movie again and then head over to the party. Maybe I'll wear scarlet and gold. I took the sorting test, and it looks like I'd be better suited for Hufflepuff, where students are fair-minded, friendly, modest, and hard working. One point behind was Ravenclaw, where students are clever, witty, intelligent, and knowledgeable. Maybe instead of scarlet and gold, I should wear yellow and black or blue and bronze. Yesterday was a bad day. Defrosting the freezer was just the tip of the iceburg. At one point, the dog was barking and both kids were crying as hard as they possibly could. I am hoping that today is better. I imagine it will be. My quilting group was postponed -- several women are sick. So I can be lazy tonight, just like I was last night. The sun is shining, the sky is a bright blue. I think we'll spend some time at the park this morning. Mini-me can get some of her energy out, and Patch can wear himself out so he sleeps for several hours. Everyone wins! This morning, I took the kids downstairs to play and noticed a puddle next to the freezer. Upon opening said freezer, I discovered a huge mess of frost and thawed food. It appears that the door was not shut tightly the last time someone (me) went down to get something. Whoops. That freezer has been a ticking time bomb for the last year. When Grandma came to stay last July, awaiting Patch's arrival, we tried to chip away at the ice with knives. Before she left, she said "You'll want to defrost that." Well, she was right. I did want to defrost that...Hopefully I can keep the freezer frost free from here on out. I have book group on Friday and have been reading Tales of a Female Nomad. Very interesting book. I usually don't care for non-fiction, but this has been a great read. She reminds me of my -sister-in-law. So does Matt, who dances around the world. Every once in a while, a big name band comes to Frederick. During The Great Frederick Fair, we get some big name country acts, like Brad Paisley. For the 4th of July, we had Blue Oyster Cult. Tonight, Milkshake was in town. They were awesome. Lisa even sprinkled some of her bottle of sunshine on Mini-me's head. Mini-me ran down to the front of the show and was part of the pint-sized mosh pit. She quickly made friends with the other kids and was practically on stage by the end. Patch amused himself by playing catch on the lawn with another boy. After so much singing and dancing, they were hot and tired and hungry. I am sure they will sleep well tonight. There was a 30% chance of rain today between 4 and 8 pm. 30% is not a very good chance. There was actually a 70% chance it would not rain. We planned on being outside for most of the day. At around 12:30, we walked down to Baker Park. Mini-me decided to be "Captain America" in honor of the holiday. To achieve this look, she wore last years Old Navy flag tee, a pair of denim shorts, red-white-and-blue curlies in her hair, and a red bandanna as a cape. I think her superpower was cuteness. Because Frederick is a small town, we ran into a lot of friends. Mini-me and her friend Mollylewing went on the mini Ferris wheel together. We then visited the peanut-butter and jelly tent. Mini-me added marshmallows to hers, but she decided she didn't like it. The guys running the tent let her take extra containers of m&ms and cereal. Patch ate his straight up. During lunch, we noticed some ominous clouds. Curly and I decided to head to his office, 2 blocks from the park, so we could wait out the storm. As we turned the corner to get to his office, it started to thunder. We got in right in the nick of time. We hoped that the rain had just come early and the rest of the day would be nice. We hoped in vain. At about 3:30, we went over to our friends Louise and Jeff's house. (Louise is our leader for the Towne Singers.) We had some great food, and our kids were able to perform. Mini-me was "Captain America" and charmed everyone there. Patch was just adorable and smiled and sang for everyone. It did not escape our notice that they were the only kids there. We are so lucky to have good friends who like our kids and let them come to nearly everything. While at the party, we learned of the tornado watch for our area, and had two more sets of showers. We went back over to Baker Park at around 5:45. I was a little worried we had missed the only song I knew by Blue Oyster Cult, but I worried in vain. It was, of course, the last song of the set. If you've ever seen the SNL skit with Christopher Walkin where they parody the making of "Don't Fear the Reaper," you know that the skit features a cowbell. The tag line of the skit is "it needs more cowbell." The actual song doesn't have a cowbell, but since the skit, they have added it. I thoroughly enjoyed the song, but found that it could have used more cowbell. Mini-me did several more carnival games until they closed them at around 7 to make room for the fireworks. We walked around, looking for the perfect spot to sit and watch the show when the heavens opened. It poured on us. Patch, who hadn't had a nap by this point, was miserable. When the rain lightened up, we decided to sit at the band shell and listen to the rag-time band and hope that the rain would end. Sadly, that didn't happen and all we had to cover ourselves were the beach towels we had brought to sit on. We were soaked. The nice couple behind us loaned us one of their umbrellas. The kids were tired and wet and finally, 15 minutes before the fireworks started, Patch fell asleep. He woke up during the 1812 Overture and didn't much care for the fireworks. Mini-me didn't care for them either, until Curly told her they were flowers in the air. After that, she loved them. By this point, her cape was on her head, trying to keep the rain off. We got home, completely soaked and a little cold. We threw the kids in the tub in the hopes that they would actually sleep in tomorrow morning if they were clean and warm. We shall see. This year will from now on be one of those stories: Remember the year it rained all evening and we stayed to see the fireworks anyway? Happy Birthday to Muncle Boo. Hope you got to fly a plane today and that your "girlfriend" made you cupcakes. I am still on lifting restrictions. Hopefully those will be lifted on Thursday when I go see my doctor. But, until then, I am getting lots of help. Not only is Curly doing all the housework (he folds the laundry as he takes it out of the dryer. Love that), he is also getting up early with me to bring Patch downstairs so I can feed him. Yesterday, my good friend Lenore came over with her daughter Allison to play. They got here at 10 in the morning and left close to 6 in the evening. THANK YOU THANK YOU THANK YOU! The girls had fun together, and Patch just adored Miss Lenore. The weather was beautiful yesterday, so we went to the park for a little bit, and we even walked to the Freeze King, which is just a few blocks away. Aunt Becky is coming today. What would I do without good friends and family who are so willing to help me? Happy Birthday to Elden, the newest member of the family. Hope you have a great day and that Melly makes you a cake.